SpaceX was established in 2002 by Elon Musk, the founder of PayPal and the Zip2 Corp and Inc. magazine's Entrepreneur of the Year in 2007. Musk has big plans for his El Segundo, Calif., rocket company, beyond its already busy manifest of unmanned military and commercial payloads. Under a contract from NASA's Commercial Orbital Transportation Services program, SpaceX is developing a spacecraft that could be used to ferry astronauts and cargo to and from the International Space Station after the shuttles are retired. The SpaceX contribution to this government-funded competition is Dragon, a spacecraft designed to carry up to seven astronauts. 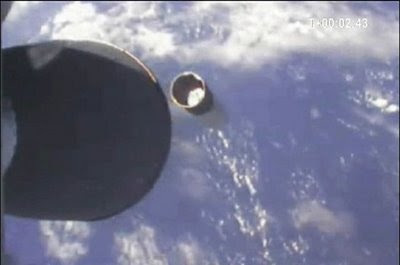 The Dragon capsule would be orbited by a heavy-lift Falcon 9 rocket, the first of which SpaceX plans to test from Cape Canaveral next year. In an online Q&A with washingtonpost.com last week, Musk mused about some other long-term plans, including the possibility of using one of his boosters to launch interplanetary space probes. "My interest is very much in the direction of Mars, so a Mars lander of some kind might be the next step," he said. He also answered a question about using Dragon for a flight around the moon -- an idea Musk called "conceivable." "SpaceX, and other NewSpace ventures like it, carry the promise of dramatically changing the space industry with low-cost orbital and suborbital launch options that open up new and potentially lucrative new markets. That promise, though, has remained just that -- a promise, not a reality -- since SpaceShipOne won the Ansari X Prize four years ago. Sunday's launch was perhaps the biggest milestone since then in demonstrating what NewSpace can offer." Taikonaut Zhai Zhigang (above right) climbed outside his Shenzhou 7 spacecraft this weekend in an experimental $4.4 million spacesuit. 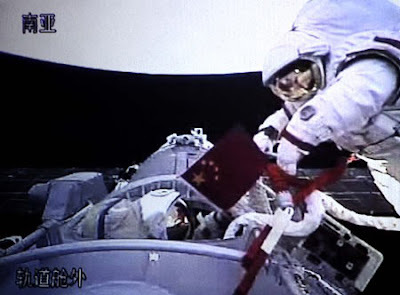 Aided by crew mate Liu Bomingalso, who stood in the open hatch wearing a proven Russian spacesuit, Zhai waved a Chinese flag as he hovered over the airlock. China's first spacewalk was being beamed on live TV across their country and around the world. China's third human space mission ended this morning when the Shenzhou reentry vehicle parachuted safely to Earth in a grassy Mongolian plain. The mission's success sets the stage for a series of more ambitious flights in the next few years, including plans for a modest orbital laboratory. I wrote some about China's space plans in a column earlier this year. Here's a brief update. A Congressional Research Service report says China's next two flights, Shenzhou 8 and 9, will ferry the module to orbit and allow the country to test rendezvous and docking procedures. The crew of Shenzhou 10 will then visit the orbiting laboratory. Those missions will give China the know-how it needs to operate an even larger space station, similar to a series of Salyut orbital outposts operated by the Soviet Union in the 1970s. China plans to orbit a Salyut-like outpost by 2020, after it completes development of a new, more powerful launch vehicle -- the ChangZheng (or "Long March") 5. The CRS report also notes that China's Shenzhou spacecraft could eventually be used to ferry crews to and from the NASA-led International Space Station -- "if that becomes politically feasible in the future." That kind of partnership would indeed be tricky politics, but the looming U.S. dependence on Russian spacecraft after NASA's space shuttle fleet is retired in 2010 could make that a more attractive option in the next couple of years. What about sending taikonauts to the Moon? NASA Administrator Michael Griffin has publicly speculated about a possible circumlunar flight -- no landing -- perhaps sometime in the next decade. Chinese space officials have denied they have any specific lunar plans, although they float the idea from time to time. Just today a spokesman's for the country's space program told reporters that the extra-vehicular activity on the Shenzhou 7 flight was a necessary stepping stone for a moon landing. But the spokesman quickly noted that "more investigation" was needed before China commit to any such course. Adapted from my "Futurist" column in the Sept. 29 issue of CQ Weekly. The child of a science writer I know once hopped into her mother's lap and took control of the family computer. My friend was amazed to watch her daughter, who was 3 at the time, use the wheel on the mouse to scroll down the screen. "Oh," the science writer said, "that's what that does!" The ad is a way for Barack Obama's team to raise the age question -- "Is McCain too old to be president?" -- without having to ask it in so many words. That's politics. Yet McCain's comments also illustrate a greater intergenerational challenge for all policy makers, even the 47-year-old Illinois senator: How to keep up with unfamiliar, fast-changing technologies -- especially those with political, legal and regulatory implications. McCain earned a little of my sympathy on this point a few weeks back, when work required me to bumble through a virtual world that tested my own online agility. My assignment took me to Second Life, a vivid online community where inhabitants create animated electronic stand-ins called "avatars" to play and do business in a bustling, game-like 3-D environment. Despite more than a dozen years of working in digital media, my visit to the much-hyped service was humbling. I was able to quickly create a cookie-cutter avatar and then "teleport" to a recruiting center built in Second Life by government officials from Missouri to help fill real-world jobs in the state's technology division. But I was hardly graceful. Using my mouse and arrow buttons, I managed to wander through the state's displays and even collect a free T-shirt to add to my avatar's electronic wardrobe. But I also bumped into walls and struggled to figure out how to make basic moves, like sitting down. All of this would have been child's play to my nephews, ages 8 and 11, who I've seen master complex new game controllers within minutes of removing them from the package. In fact, the difference between their natural ability and my own klutziness is the difference between what some experts in online learning and behavior describe as "digital natives" and "digital immigrants." John Palfrey and Urs Gasser popularize the idea of online natives and immigrants in their accessible new book, "Born Digital", although educational game creator Marc Prensky is generally credited with coining the terms. In 2001, he described how technology was rewiring the brains of this generation of children to "think and process information fundamentally differently from their predecessors." Digital immigrants, on the other hand, "adapt to their environment" but "always retain, to some degree, their 'accent,' that is, their foot in the past." That accent can be particularly thick when it comes to setting policy, which may explain why government leaders have been so tongue-tied in trying to address critical technology challenges for more than a decade -- from modernizing intellectual property laws and updating security practices to establishing policies that foster competition in telecommunications and increase reliable and affordable access to faster online services. Technology also creates new expectations for transparency and accessibility. In that context, comments such as President Bush's past musings about "rumors on the Internets" and using "the Google" to view a satellite image of his Texas ranch deepen the divide between the immigrants and natives. Garrett M. Graff, in an essay in The Washington Post last year, argued that the press and the public were being too easy on digitally illiterate politicians in a way that would be unacceptable on questions of foreign policy or macroeconomics. "Why is it," he asked, "that we blithely allow our leaders to be ignorant of the force that, probably more than any other, will drive and define the nation's economic success and reshape its society over the next 20 years?" Obama's ad mocking McCain's tech savvy offers no such allowance. It aims to make the Republican seem out of step with online immigrants and natives alike by reminding them that he "admits he still doesn't know how to use a computer" and "can't send an e-mail." In truth, McCain has said he's only made tentative forays into the digital world. He told The New York Times in July about several blogs his wife and staff have shown him -- and he promised he was "learning to get online myself, and I will have that down fairly soon." He described reading messages on other people's BlackBerrys but noted that he "never felt the particular need" to send e-mail messages of his own. All of that may have sent an entirely unintended message to digital natives. The message to other political leaders: It's time to log on. Meet one of the newest employees in Missouri's Information Technology Services Division. That's him above, the cute gray cat in the red bow tie. Well, that's what one of his computerized "avatars" looks like anyway. Avatars are stand-ins for people who use virtual worlds such as Second Life, the popular, almost game-like online universe where Missouri opened a modest recruiting station more than a year ago. And the state's very first Second Life recruit was the small cat whose real-world identity is Ben Rhew, 27. A 2003 graduate of the Missouri University of Science and Technology in Rolla, Rhew is exactly the kind of young computer engineer many state and local employers are trying to lure to government work before a looming wave of retirements depletes their ranks. On average, 1 in 4 state government IT employees are expected to retire within five years, according to a survey by the National Association of State Chief Information Officers. Government leaders have a mediocre track record when it comes to recruiting the next generation of workers into public service. (See: The Young and the Restless, from Governing, Sept. 2007). But virtual worlds and online communities such as Second Life may offer promising new hunting grounds, especially for young, up-and-coming techies. Rhew describes Second Life as a "3-D chat room" where "you can pretty much do anything you want" -- especially if you have the right combination of basic programming skills and imagination. The mix of stores, homes, clubs and other hang outs is as diverse as the population of on-screen characters, any of whom can walk, fly or even teleport from one hot spot to another. Transactions are done in "Linden dollars" -- a currency named after the service's parent company, Linden Lab. But favorable "exchange rates" mean actual U.S. dollars go a long way. Dan Ross, Missouri's chief information officer, estimates that all of his organization's "in-world" recruiting has cost a little more than $200 in taxpayer money so far. Ross' office was among the first major public-sector employers to use Second Life to search for talent. A large rotating state seal marks Missouri's online outpost. "IT Jobs Now Available," a sign at the entrance announces. "Come in and browse." Inside, visiting avatars can click on screens with Web links to information about the kinds of technology work the state needs done. A kiosk collects contact information for state recruiters to follow up by e-mail. There also are free T-shirts for visitors to add to their avatar's online wardrobes. Missouri's presence made a big impression on Rhew, a self-described Second Life addict who has created multiple avatars for himself and others. Rhew says he first heard about his state's innovative online recruiting efforts when he began looking for a new job within commuting distance of his home in the Rolla-St. James area. After one brief visit to the recruiting station earlier this year, he returned to attend a "job fair." Other attendees nearly sat on Rhew's diminutive feline avatar, which is only about the size of a typical character's foot. But Rhew made an impression anyway. A rapid-fire series of real-world interviews quickly turned into an offer to work on applications development for the Department of Natural Resources. He started work at his new Jefferson City office last week. Rhew is as surprised as anyone that his online pastime would help land him a job working in state government. "I never expected this to happen," he says. And he certainly will not be the last Second Life recruit to end up on a public payroll. Whole blogs have popped up devoted to recruiting in virtual worlds. And with many large, technology-oriented corporate employers looking to Second Life and other online communities to identify and compete for talent, government leaders may have little choice but to create their own avatars and follow Missouri's lead -- unless this just turns out to be a fad. Even Ross -- whose avatar you might be able to identify by his sparkling shoes -- thinks it's too soon to say how important these emerging avenues of communication will be going forward. Nonetheless, the CIO and his management team are working with the staffs of other agencies to examine possible uses beyond recruiting, as well as the right rules of conduct for state employees whose work takes them into this alternate dimension. So where to start? Second Life's Wiki offers some examples of what various government organizations are up to, while David D'Angelo's blog Recruiting in Second Life is a good source for information on how employers in all sectors are using the service specifically for h.r. purposes. Video links on David's blog (on the right side of the page) also will give people who have never visited a virtual world a sense of what the experience is like. For those who are ready to take the plunge and try it out, the Association of Virtual Worlds offers a group for newcomers. And once in Second Life, users can find Missouri's recruiting station on "Eduisland 3." As it happens, the state is making plans to renovate its site -- and has posted an opening for a student intern to help. Some online recruiting is less direct. Governing's May 2008 special report on what Web 2.0 trends mean for state and local government included a section on how a southern California hospital district used Second Life to build a working online model of a planned $850 million facility. The virtual model showcases the administrators' plans for using cutting-edge medical technology, in large part to help the new hospital gain "competitive advantage" in attracting the most qualified doctors and nurses. Here's a video of the simulated hospital. Apparently virtual reality isn't just for recruiting computer engineers anymore. Case closed: e-government increases crime. At least that's what seems to be going on here in Fairfax County, Virginia. The affluent D.C. suburb where I live has seen significant jumps in the numbers of serious crimes reported in recent years. But local police attribute the increase at least in part to their efforts to promote an upgraded system that makes it easier for victims to report some crimes online and by phone. I've already heard an example of such thinking at a GOVERNING technology conference in Seattle a few months ago, during a daylong workshop on municipal 3-1-1 telephone lines. One official from a medium-sized northeastern city lamented that providing 3-1-1 was only increasing demands and expectations for government services in his community -- from filling potholes to disposing of roadkill. "If we miss one dead dog we get creamed," the official said. Fairfax, on the other hand, takes great pride in its online offerings. Its e-government efforts have been ranked among the best in the country by the Center for Digital Government and the National Association of Counties in their annual Digital Counties Survey. Gerry Connolly, chairman of the Fairfax board of supervisors, once said that recognition was "an excellent reminder of how technology can connect residents and their local government." So I'll be watching to see how he and other officials respond if the crime data becomes an issue in a local congressional race, in which Connolly is a candidate.